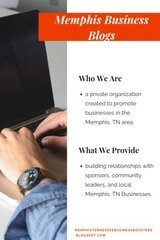 The Memphis Business Boosters pride in helping local businesses in Memphis to enhance their performance and boost productivity. Since its establishment in 1975, the association has been committed to promoting business in the city and its environs. It has also helped new businesses and startups to get funding for their projects and business ideas. The MBB has also taken an active role in training young upcoming entrepreneurs to equip them with the right skills required to run a successful business venture. They have assisted several businesses to get financing for different business ideas. However, this has not been possible without the help of a few dedicated and selfless volunteers who have taken great pride in helping the association to make positive contributions to help improve the lives of members of society. In fact, the MBB is constantly in need of volunteers, as most of them do not work for the organization over a long period of time. Over time, they become committed elsewhere to pursue other life interests. The organization’s headquarters is located in the heart of Memphis, within Shelby County. This is also where most of the organization’s operations occur. The Memphis Business Boosters was established to help stimulate economic growth by promoting business activities. The MBB accomplishes this mission by facilitating business activities and coordinating relationships between sponsors and various stakeholders. More volunteers will help the association to accomplish its mission, vision, and objectives. Soliciting New Members:- Volunteers look for new members to join the organization. New members may include new member organizations, consumers of the products of member businesses, and fellow volunteers. Welcoming New Members:- Once new members have been recruited, volunteers are expected to welcome and brief them on what the organization is all about. Volunteers also inform new members of their roles. Training Volunteers: Volunteers should train new members to equip them with the knowledge and skills required to execute their duties as expected. Safeguarding Organization’s Assets:- Just like other employees of the MBB, volunteers are expected to safeguard the assets of the organization by ensuring that all pieces of furniture taken out and used outdoors are returned to where they should be to prevent potential damage by rain and harsh elements of weather.